Come into our kennel, and meet our sled dogs. Want a little love in your life? 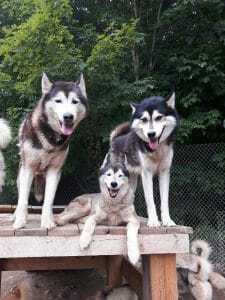 Come snuggle with some of our beautiful and incredibly friendly Siberian huskies at our onsite kennel! While visiting the dogs, you will have the exclusive opportunity to learn and ask questions about how they run as a team, and love doing it. Each Tour will be approximately 30 minutes in length. Register in advance under our Summer Events to reserve your visit. Cost: $5 per person, $10 per family. Loved visiting the dogs? Book a dog sled tour for you and your family this winter.